Ginger root is boiled in sugar water, and then coated with additional sugar. Ginger has been used for centuries to treat a variety of conditions, including upset stomachs. Ginger’s spicy and aromatic flavor is highly prized by some people. Ginger is also used to aid digestion. After ginger was first introduced in Europe (approximately 800 AD) it ranked second to pepper as a spice for centuries. 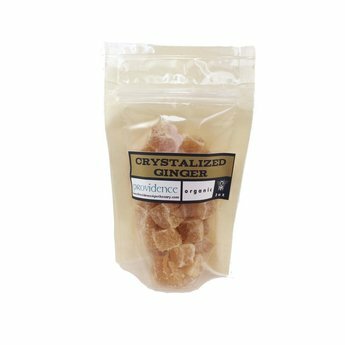 Crystallized ginger should be stored as a food; in dark dry environments. Be aware of the high sugar content of crystalized ginger!